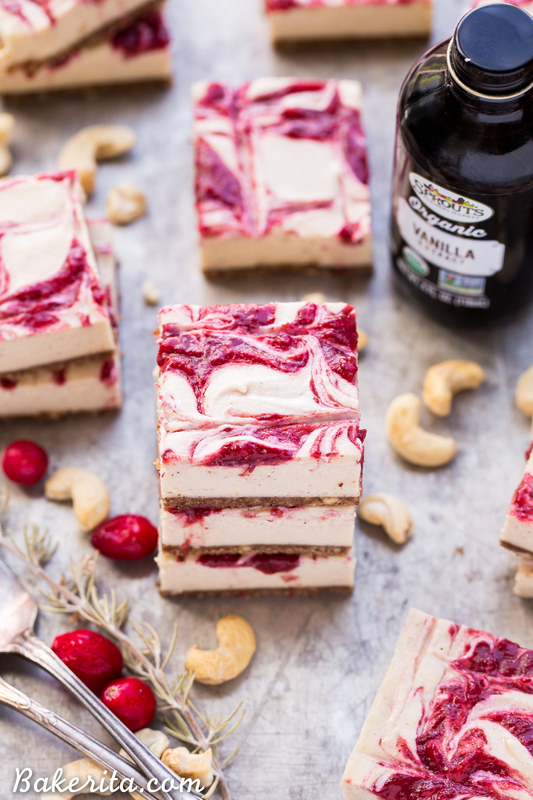 These No-Bake Vanilla Bean Cranberry Swirl Bars are made with cashews for a smooth and creamy “cheesecake” that’s completely paleo, dairy free, vegan, and gluten free with no baking required! You can use leftover cranberry sauce for the tart cranberry swirl, and these can easily be made ahead of time. This post is sponsored by Sprouts. Cranberries, in my opinion, are one of the underrated flavors of winter. They’re tart, but in a way that makes them perfect in sweet treats – the fruity tartness pairs fabulously with subtle sweetness, particularly maple syrup, and makes any dessert they’re in burst with flavor. Case in point? These Cranberry Crumb Bars have a beautiful flavor juxtaposition of tart vs. sweet, and the cranberries in this Cranberry Apple Crisp make a classic dessert next-level delicious. They have a way of amping up any dessert, and pair amazingly well with the warm spices so prevalent in winter baking. Frankly, the most common place we see cranberries all fall and winter long is on the Thanksgiving table, in the form of a big bowl of cranberry sauce. And if most families are like mine, you always end up with lots of cranberry sauce leftovers. 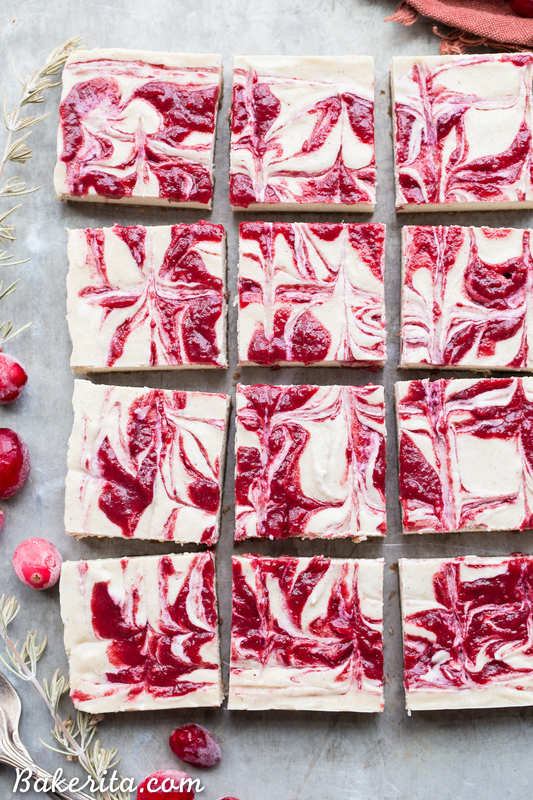 These Vanilla Bean Cranberry Swirl Bars are a way to use some of your extra cranberry sauce before your Thanksgiving meal AND create a Thanksgiving dessert at the same time, or you can whip these up when you’re staring at a bowl of leftover cranberry sauce in the fridge, wondering what to do with it. Of course, you can also just make the quick cranberry sauce I’ve included if you don’t have any on hand (based off my favorite paleo cranberry sauce recipe), but I love that part of this recipe can be traded out to help you use up some leftover food. Another reason why these are the perfect Thanksgiving dessert: no baking necessary! These won’t take up any precious oven room on the big holiday, and you can prep them ahead of time. That’s always a holiday recipe win, don’t you agree? I loaded up on all of my ingredients for this recipe at Sprouts – they have amazing quality products, and they always have all the organic products I need, often super affordably by their house brand. The bulk bins are also always a stop on my trip, to stock up on nuts and seeds. For this recipe, I picked up organic pecans and cashews, cranberries, maple syrup, coconut milk, coconut oil…pretty much all the goods! 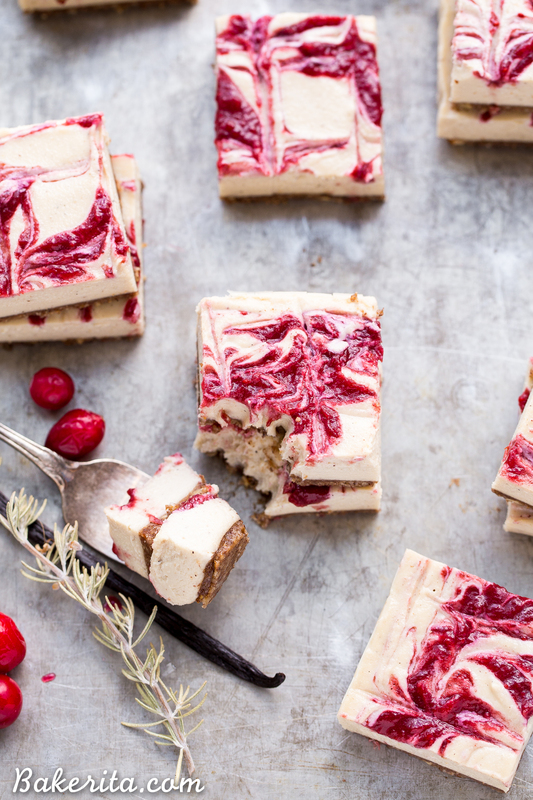 To make these Vanilla Bean Cranberry Swirl Bars, you really just need a food processor or a high powered blender – both the crust + filling are whipped up in one. The crust is made from a combination of pecans, almond flour, 2 dates for a touch of sweetness, a little coconut oil, cinnamon, and salt. It’s all pulsed together until it’s sticky, and then pressed into the pan. For the creamy vanilla bean cheesecake, all of the ingredients, including the soft soaked cashews, are combined in the blender and pureed into a luscious vanilla bean-flecked filling. It’s poured over the crust and the cranberry sauce is swirled onto the top. If you want more cranberry flavor, I’d suggest dolloping some in the vanilla filling before you pour it over the crust and folding some in, to get swirls all the way through, instead of just on top. 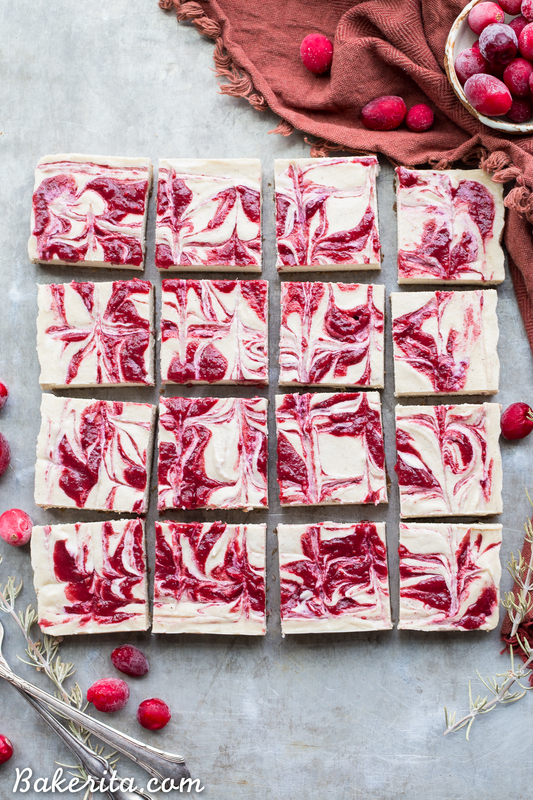 These Vanilla Bean Cranberry Swirl Bars are rich and lusciously creamy, with a smooth vanilla bean flavor and pockets of tart cranberry flavor adding fruitiness to help cut the richness. They’re a perfect, unique dessert for the holiday season. Enjoy! 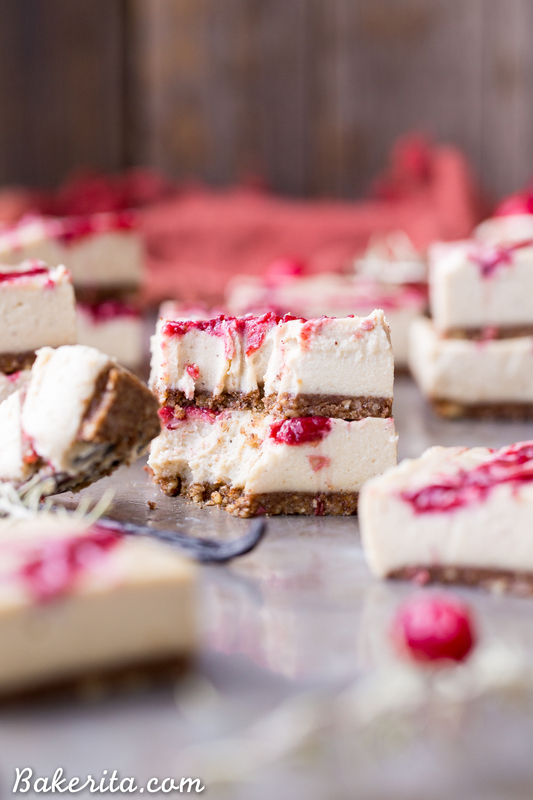 These Vanilla Bean Cranberry Cheesecake Bars are made with cashews for a smooth and creamy "cheesecake" that's completely paleo, dairy free, vegan, and gluten free! You can use leftover cranberry sauce for the tart cranberry swirl. Line an 8” square pan with parchment paper for easy removal, and grease well with coconut oil. Set aside. Prepare cranberry sauce (directions below) and set aside to cool, if not already prepared. Add the pecans, almond flour, pitted dates, coconut oil, cinnamon and salt to a food processor or high-powered blender and pulverize until it comes together into a sort of sticky dough, with small pecan bits remaining. Don’t over process, or it’ll turn into nut butter! Press the date dough evenly along the bottom of the prepared pan. Pour the filling into the prepared pan over the crust. Smooth out the top and tap the pan hard against the counter a few times to release any air bubbles. Dollop about ⅓ cup of cranberry sauce around the top of the cheesecake and use a sharp knife to swirl it in. Tap hard against the counter once more to settle everything. Place in the freezer to set for at least 3 hours or until completely frozen. Let them thaw at room temperature for 10-15 minutes before serving. I recommend running your knife under hot water to warm it up before cutting the cheesecake with the still-hot (dried) knife. Store leftovers tightly wrapped in the freezer. Add cranberries to a medium saucepan. Add maple syrup, orange juice, orange zest, and spices to the pan and cook over low heat, stirring occasionally until the cranberries are soft, about 10 minutes. Increase the heat to medium and cook until the cranberries burst and cook down, about 10 more minutes. For a very smooth sauce, use an immersion blender to smooth it out. Transfer to a bowl to and let cool. This post is sponsored by Sprouts. As always, all opinions are my own. Thank you for supporting the brands that support Bakerita! 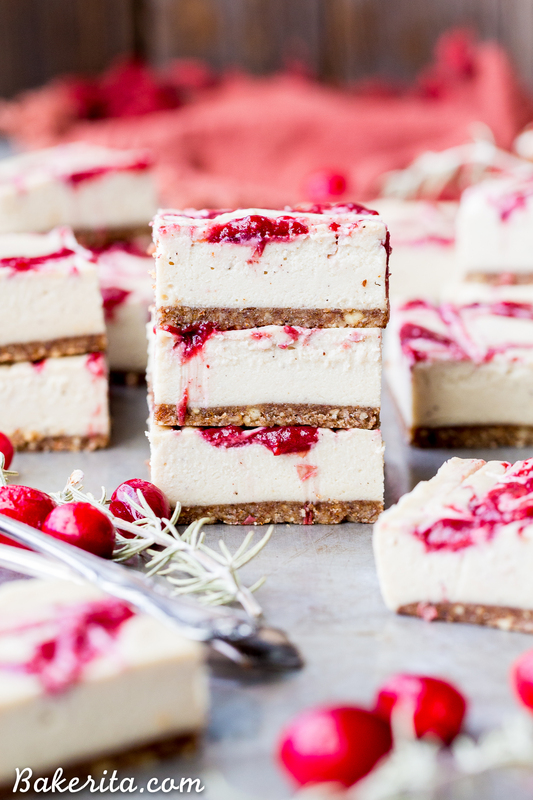 These cranberry cheesecake bars look amazing! What a delicious dairy-free treat for the upcoming holidays! And is it possible to use a different milk (almond milk…)? Hi Tamar, my coconut milk doesn’t say what percentage it is! I would go with the 20% though, for the best results. You could try using almond milk but it’s thinner, and might not set up as firmly. How big are the finished bars? A 6 inch pan seems very small for 16 bars. Whoops! You’re right, that’s meant to say 8″ square pan, it’s fixed now! Such pretty bars, I love that cranberry swirl! Thanks so much Laura, they’re so tasty! Sorry if this is a silly question, but do you toast your pecans beforehand or does Sprouts have those available? Thanks! We don’t have fresh cranberries in Australia so can you use frozen instead. These look amazing by the way. Yes frozen would be totally fine! Can you make this as a whole cheesecake? Definitely, for this recipe yield you’d use a 6″ springform pan, or you can double the recipe and use an 8″ pan. Enjoy! I’m reading most of these bars are to be frozen or refrigerated until ready to eat . Do they get soft and misshapen when they get room temp? Hi Angeka, yes they’ll definitely be soft at room temperature, especially if it’s warm out.